The Buzludzha Monument, located in the mountains in the heart of Bulgaria, is an imposing example of 20th-century architecture. It was built in 1981 to be the House-Monument of the Bulgarian Communist Party. The structure was used for just 8 years until the end of the Communist regime in Bulgaria in 1989. 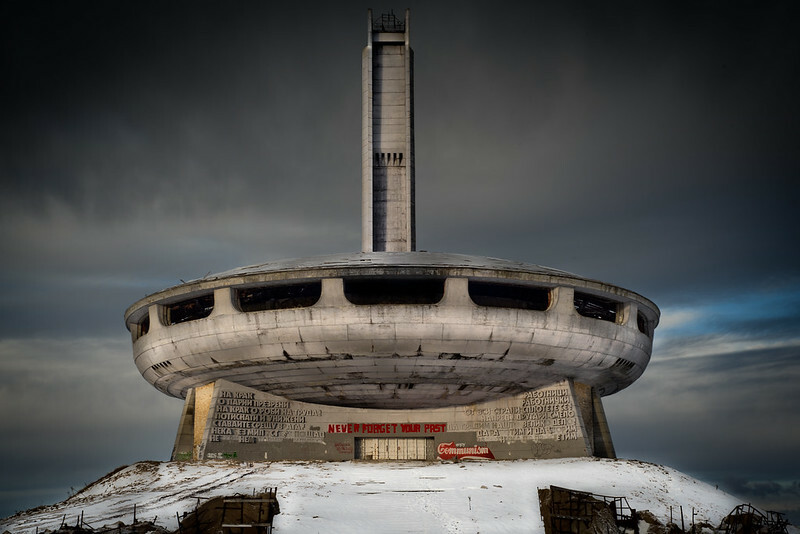 Soon after the end of the regime, the Buzludzha Monument was abandoned and has since been victim to thefts, vandalism and severe weather conditions. The windows and roof have been severely damaged, exposing the structure to weather year-round, including the heavy snowfall experienced in the area. No action has been taken by the responsible authorities to protect the site so far. The monument’s mosaics cover more than 1,000 square meters of space and communicate the history of the Bulgarian Communist Party in imagery that echoes the Socialist-Realist style. The mosaics inside were constructed with cobalt glass while the mosaics on the outer ring of the monument were built with natural stones gathered from various rivers across Bulgaria. Today the ostentatious finish of its Brutalist architecture, heavy iconography and colourful mosaics has decayed, however the building attracts increasing attention with its dramatic history, its striking architecture and the vision it affords of deteriorated extravagance. Its destiny is similar to that of several hundred monuments built during the Communist regime in Bulgaria and the entire former Eastern Bloc. The recent heritage of these post-Communist countries is often traumatic and unfamiliar to a broader public. The significance of this monument as a lieu de mémoire (place of remembrance) on a European level is therefore evident. On one hand, the environmental impact of the building, which so drastically altered the surrounding context presents itself as point of contention when discussing its preservation. The strong ideological message that is communicated by the sheer size of the monument and its interior imagery likewise presents a problem: how can this be preserved in a way which does not inadvertently glorify or reiterate a political ideology? On the other hand, it can be argued that allowing the monument to gradually decay does not acknowledge the human labour which was spent to construct it, the quality of the decoration or its symbolic significance as a representative of 45 years of Communist rule in Bulgaria. The Buzludzha Project Foundation, which nominated the site for the 7 Most Endangered programme 2018, proposes that as one of the masterpieces of this period, the Buzludzha Monument could become an example for due preservation and interpretation of other similar heritage sites throughout Central and Eastern Europe. Conservation work to stabilise the building and the preparation of the monument for sustainable tourism are proposed as the most viable long-term solutions for its survival.